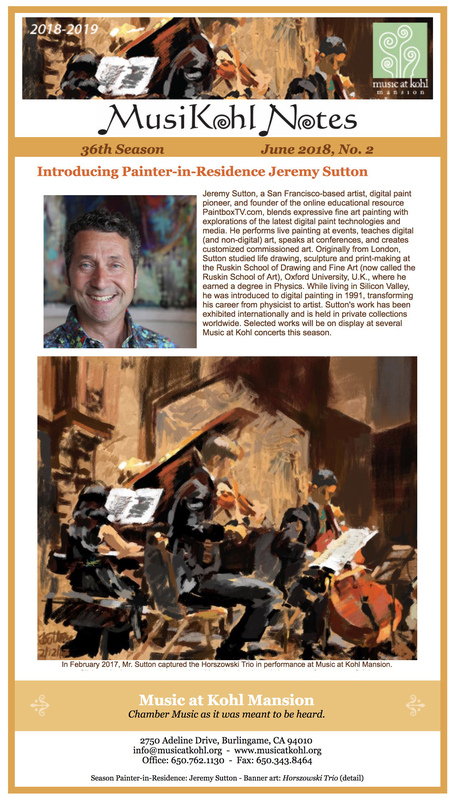 I am the Painter-in-Residence for the current 2018 / 2019 season at Music at Kohl Mansion – an annual series of chamber concerts in the historic Kohl Mansion, Burlingame, California. Click here (or on the image above) to be linked to the Music at Kohl Mansion June 2018 newsletter with information about the season. 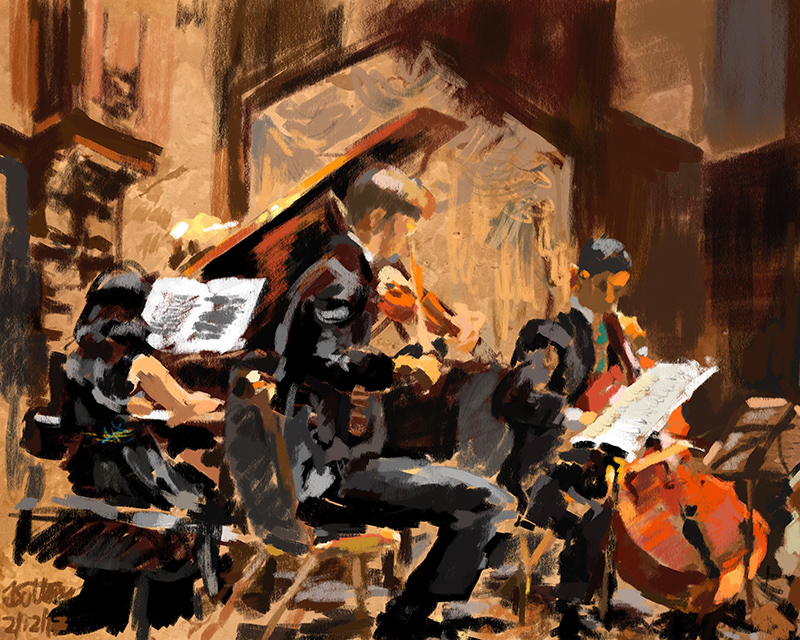 For the two remaining concerts of the season on April 14th and May 12th I will paint live on my iPad as the musicians play and display artworks afterwards in the refreshments room that were created at the Music at Kohl Mansion concerts. It’ll be wonderful to see you at these last two concerts! 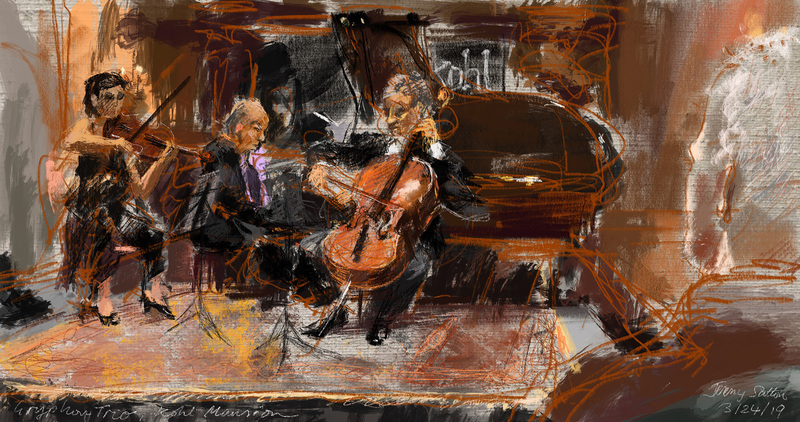 The artwork featured in this announcement is my iPad painting Horszowski Trio at Kohl Mansion. Here are some other works created during Music at Kohl Mansion concerts. Gryphon Trio, March 24th, 2019. The music featured on this replay video is Antonín Dvořák’s “Dumky” Trio No. 4 in E Minor, Op. 90, B. 166, one of the pieces they played in this concert. 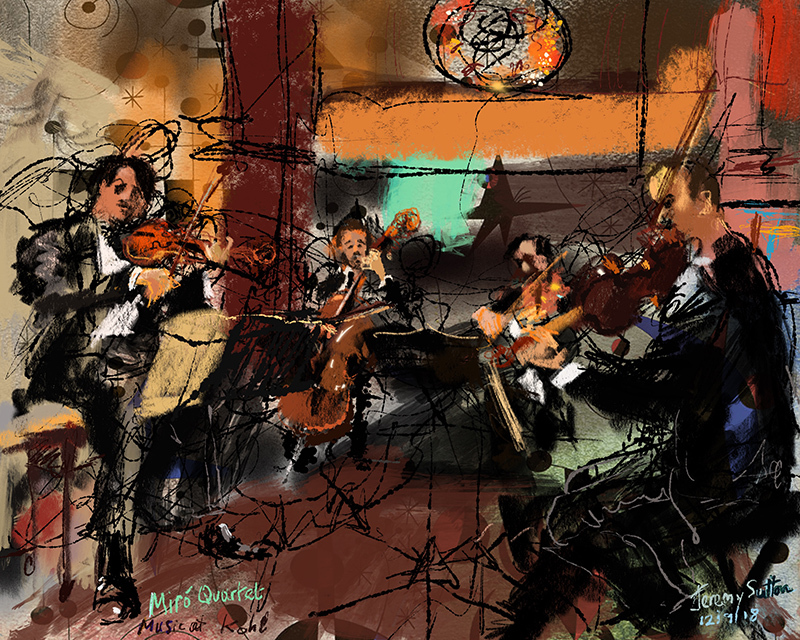 Miró Quartet, December 9th, 2018, String Quartet No. 2 in A minor, Op. 13, composed by Felix Mendelssohn in 1827. The tools I use for these paintings are the iPad Pro 12.9 (3rd Gen.), Apple Pencil 2 and the Procreate app. Each image is enabled with Augmented Reality that will show the replay video on any mobile device via the free HP Reveal app. Many thanks to the fabulous and inspiring performers and to Patricia and her magnificent Music at Kohl Mansion team!